I wish I could stay in Iceland for 10 more days, so that I leave on the same day as the sun. Soon, Seydisfjordur will be cast in the shade of the fjords, there will be no shadows in town until late spring of next year. Every day the sun is inching closer and closer to the earth, casting long silhouettes across the fjord, highlighting the white mountain tops with bright light. I am sitting in the Keflavik airport, wet and cold to the bone, waiting to board my flight back to New York. I am so sad to be leaving. Everyone here has been so kind and generous towards me, they have made me feel like I belong. It has been heart breaking to go from one house to another saying my goodbyes. This village isn’t like anyplace in the world. Doors are unlocked and everyone lets themselves in, at all hours of the day. Everyone here is family; if you trace anyones family line back a few generations, they are related. The perfect illustration of this is the lack of family last names in Iceland. Because the whole country functions as a small town, they do not pass down family names. Rather, you adopt your fathers first name with the suffix -dottir (daughter) or -son (son). Everyone is someones daughter, who is someone else’s son- just like you would connect a family tree. Similarly, on the eastern fjords, everyone is connected not just by blood but also by the history of the land. There were a few farming families, who used to be separated by hours of travel up and down the fjords, that are now connected in Seydisfjordur. Everyone in town can trace their ancestry back a few generations to one of these original farms. The farming community met here, in Seydisfjordur, at the port. In most homes here, you will find old photographs of Seydisfjordur- pictures of everyones ancestors. Smari, a kind and generous man who welcomed me into his home and family for many meals and shared the surrounding farm lands and history with me, lives in a classic Icelandic home, full of rock collections, antiques, kitsch decorations and old family photos. Whenever someone in town comes up, there is always a photograph he can point to, of his great relatives with theirs. He tells me stories, about how his grandfather was saved from drowning by Anna’s, a kind woman who lives in town. He stresses that he is, “really really related to him” when I mention the old major of Seydisfjordur, explaining that he is directly related to both Vilhjalmur’s mother and father. He points to this picture to show the relations. Everyone is related, by blood and history. On one of my last days here, I drove to Lungafjordur, on the other side of the fjords. The drive was long; we drove over and under the eastern fjords, passing the many small fishing and farming villages sprinkled around Seydisfjordur. Everyone in town has ties to these farms. Sigri Dur was driving me; when we passed through Borgarfjörður, the same village that my mom and I had driven to just a week before, she pulled over and let herself in to the first house she passed, to use the bathroom. It is hard for me to wrap my New York mind around the idea of unlocked doors and open homes, but if you have known everyone your whole life, you have no need for locked doors. The drive to Lungafjordur was all off road. We drove for three hours over bumpy, volcanic earth. Along the way, Sigri Dur pointed out landmarks: reindeer on the mountain top, snarling troll faced rocks, volcanic formations and the remains of massive avalanches. If you look closely, you will see reindeer heading East. The Old Wench and her shadow. We arrived to the ancestral family farm, a small yellow structure on a black sand beach. The farm and the church next door where built by Magnus’s great great grandfather. There is so much more I want to write about— every day here is full. I have no commitments; I have the flexibility to be open and adventurous every day. I don’t have to worry about making plans or feeling rushed. Every day here, I have challenged myself to enter into new situations, to meet new people, and to feel uncomfortable at times. Because I have no place to be, a trip to the grocery store often takes four hours- along the way I may see a friend or notice something new. I wake up every morning feeling excited and amazed by the beauty and rich culture of this village. The other day, while on a run, I passed two fishermen unloading fish from a boat. This was the first time that I had seen fishermen operating separately from the government monitored fish factory. ___ and his brother ___ are both from another era. They are the only fishermen in Seydisfjordur working independently from the factory. Every day, at two o’clock, they work for a few hours, operating out of a small storage facility in between the two large fish factories. They don’t speak much, and when they do, it is just in Icelandic. I spent a week with them, meeting them at the fish docks to help and watch their instinctive rituals: the two brothers have been working together for their whole lives, and it is evident in the way they move, in classic Icelandic style, stoic and goofy, they spend their afternoons practicing traditional fishering, despite the modern factories that operate on either side of them. Weeks of fishing is preserved in their storage facility, a tin locker on the docks. Inside, the ground is frozen, causing my wet feet to stick to the ground like a tongue to ice. The temperature and humidity drop when you walk into the dark container. The air is salty, fragrant with death and old fish. We skinned fish and dumped the carcasses into the water, watching as sharks and marine life pulsed under water and birds filled the air. This week was also marked by two events- the closing exhibition of Heima (Schnee Cap) and Haustroði, the annual Autumn Feast. My fellow residents and I cleared out the studio space that we have been working in for the last two months and curated a show of our work. 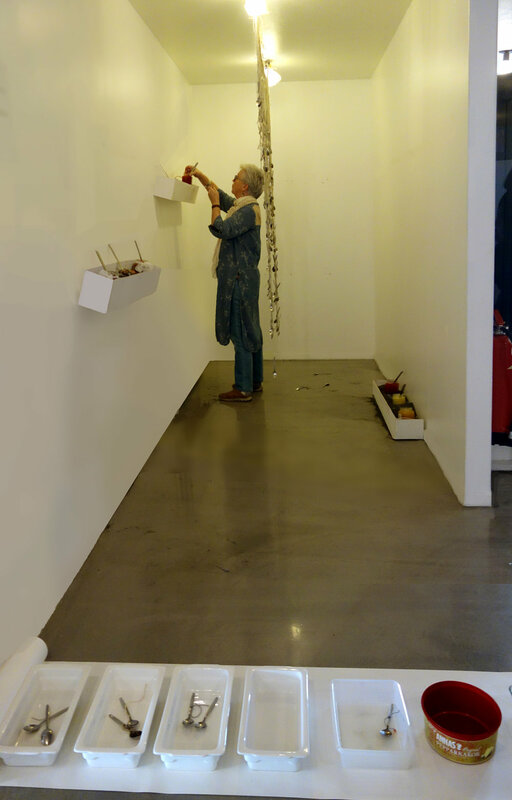 It was fascinating to curate in the same space where the work was created, particularly as it related to surfaces- the studio consists of wood and white walls on cement ground. We have all been working on different surfaces (warm, cool / light, dark), and because of that, we have become accustomed to looking at our work in relationship to very different backdrops. Some of us are used to wood and barely notice it, finding the white walls or dark floors disruptive and vise versa. In putting together the show, we rearranged the space- which has been divided my whole time here. Because everything was made in the studio, the emphasis of the show became relational- everything was dependent on the shape of the space and the relationship of art works to one another and to the structures of the gallery/studio. The exhibition opened on Saturday, the same day as Haustroði, where I was also hosting an installation. Haustroði is an annual harvest feast held every autumn in Seydisfjordur. People from the surrounding fjords come to town to buy and trade goods: knit mittens, smoked duck, fermented shark, rye breads, and most of all, homemade jams. Halldór Ármann Eiðsson and Sigurlaug Margrét Bragadóttir, who own and operate the fish factory in Borgarfjörður Eystri, where my mom and I visited the rows of dangling fish heads. Coincidentally, their house is also the very home that Sigri Dur and I stopped at to use the bathroom on our road trip. Sigri Dur let herself into their home and explained that she has known them for half a century. I have heard rumors of the jam contest since I first arrived here. Most of the town enters the contest, with a variety of jams- some using exotic ingredients like ginger and chili peppers, others using foraged crowberries and rhubarb. After talking to the women who volunteer on the rescue team (over more then a few bottles of wine and legs of lamb), they encouraged me to join the harvest festival. We had been discussing how to integrate the historic community in town with the new, artist community. They all agreed that if I planted myself in the center of Haustroði, all people would engage with my installation. Taking their advice seriously, I plopped myself right in the center of the Haustroði market and took on the responsibility of organizing the jam contest- integrating it into an installation. Ragga makes chili / paprika jelly and rugbrod every year for Haustroði. As I planned the installation, I talked to Ragga, who I help in the community center. I told her my ideas, and she told me she didn’t like most of them. I came back to her throughout the week, simplifying concepts until she was excited about the installation. I knew that if Ragga liked it, and felt like she could engage with it, everyone else would. 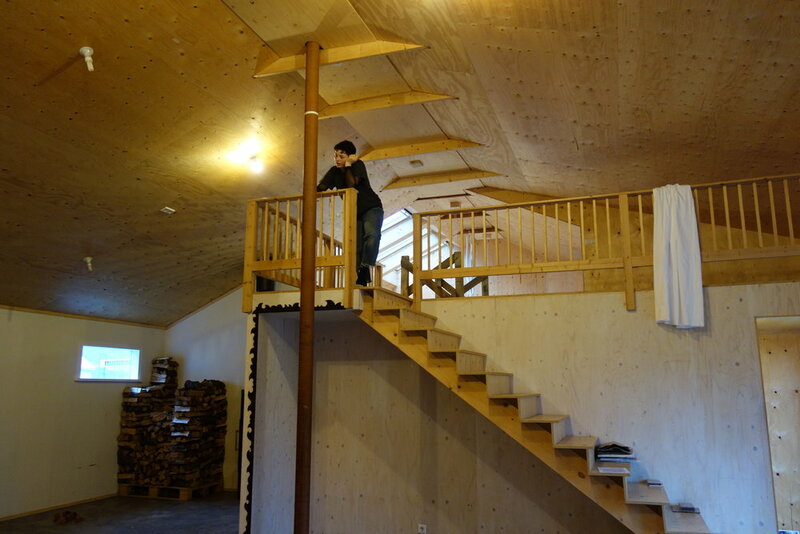 My main intent for the installation was to involve the community while pulling from the agricultural techniques and patterns I have seen in iceland- both growing techniques from new, geothermal greenhouses and in old preservation techniques, used in smoke houses and outdoor drying racks. For the jam contest, I mimicked a greenhouse, replacing the lights so that the long, greenhouse shaped space was lit with a warm, yellow light. 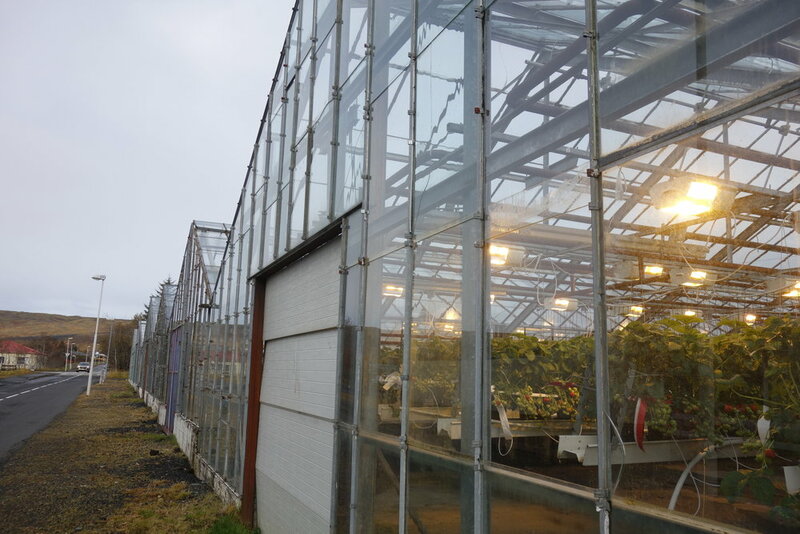 Driving past geothermal regions of iceland, you will see rows of festive, glass houses, glowing with warm LED light. They are so appealing, particularly now that the days are getting shorter. The warm light is inviting and comforting, synonymous with growth and nutrients. I situated planter boxes at different heights along the two sides of the room, mimicking the layout of a green house. When I first arrived, the other residents and I took a trip to a local farm. 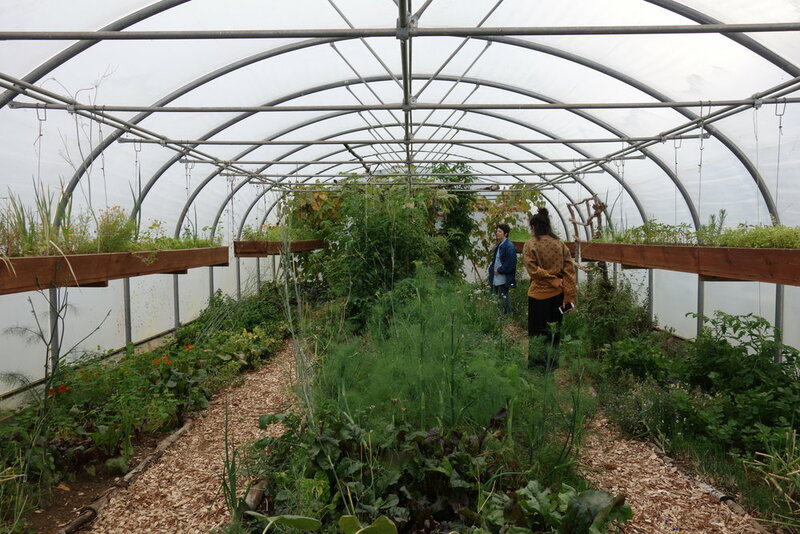 We all had a very human reaction to the fertile environment of the greenhouse- after so many weeks of not seeing garden plants, we stood on our tip toes and stuck our noses into the elevated, hanging planters of fresh and fragrant herbs. We bent and dug through the garden looking at ripe zucchinis and eggplants. We climbed into trees to find fruit. All our our senses were amplified because it had been so long since we had smelled fresh soil or seen something so easily edible grow abundantly from nothing. I ask the participants to mimic these movements. Why are the spoons hanging? Another agricultural trend I have been fascinated by is hanging. In most environments, the floor is empty. Instead, plants, drying meats, fish heads, bags of hay and fermenting shark are hung on skeletal structures. 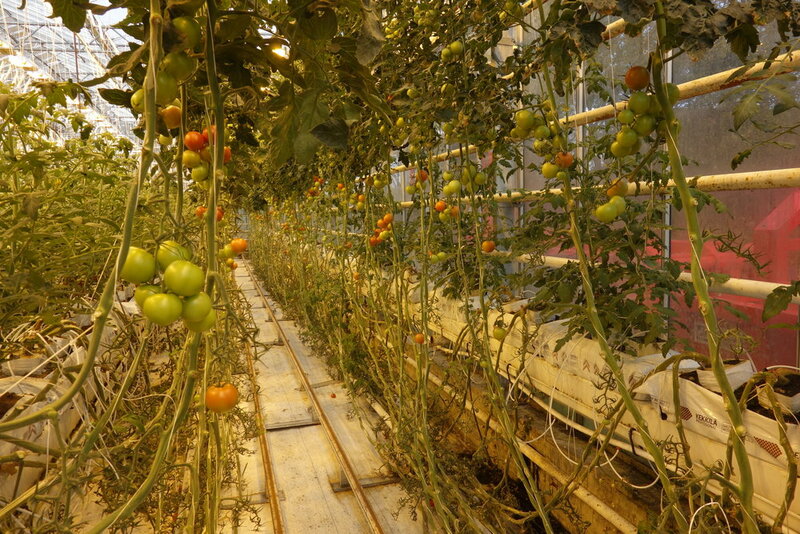 Similarly, in the tomato green house, rows of tomatoes grow up thick ropes. The hanging of the spoons in the center of the space functioned in more ways then one. They solved the issue of the space, which is long and narrow. Many people can fit into the space without knocking over anything, the installation isn’t fragile, it moves with the people inside of it. Vibrations and motions cause the spoons to jingle like chimes as people move in and out of them while mirroring drying/growing agricultural products. At the end of each row of drying racks in Gardur, there is a bucket where the left over fish heads are placed. At the fish market, there are rows of fish, stacked in buckets. buckets of tomatoes. buckets of hooked fish flesh. Similarly, buckets are placed at the end of the two “rows” of jam. You dispose of your spoons in the buckets, you cast your vote. At the end of the day, I was really happy with how the installation played out. More then anything, it was a practice in social involvement. It was a challenge to take what I wanted to do and prioritize my ideas, in order to create an environment that everyone could enjoy. In one room, people of all ages and genders were interacting. The installation was playful and light hearted, but also very serious. It was rooted in town history but also a reflection of the new, changing culture in town. It payed homage to the country as a whole, as well as its physical space and function, as a annual feast and contest. SULTA! was very different from the other projects that I have done here, but in the end, I left feeling the best about it. My whole time here, I have been trying to understand and solve the problem of a cultural residency. It has been so challenging, in many positive ways, to make art that is about a community that I am temporarily on the outskirts of. I feel guilty leaving when so many people have invited me into their lives. I have built relationships here and a life that I could imagine living, I can understand what this life is like. I wouldn’t have gone about this residency any other way, but it is so hard to say goodbye and to uproot my life again, transplanting myself back in New York. On my last day here, I took a long anticipated trip down the fjord to Vilhjalmur’s dairy farm. As you walk down the fjord, you truly leave the world behind. Before you can see the farm, you are alone, on the edge of the world. And then you see the farm, and you enter a different era. The farm sits among the ruins of the old city- cement structures that were once turf houses. It is all that remains in use from that time. As I walked onto the property I could see that someone was watching me, movement behind the lace curtains that overlook me, the roaming sheep, and behind us, the fjords. She is sitting in the kitchen window, watching me. Before I can knock on the door, a little old woman opens the door, her back is permanently hunched over from years of working on the land. She greats me in Icelandic, I respond in Norwegian, and the shaky dialog that has become all to common, begins. She runs the house and the farm here, making homemade skyr and taking care of the livestock. There is music playing from an old radio that sits on the window next to stacks of newspapers. She is reading a thick, Icelandic novel. 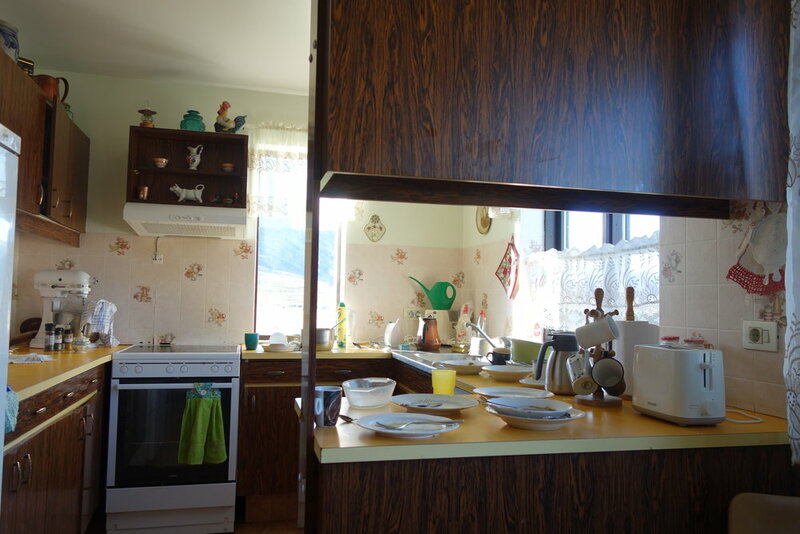 The kitchen counter is full of recently used pots and pans underneath tidy shelves with cow figurines and roaster pitchers. embroidered tapestries on the walls. In classic Icelandic style, there is a large blender on the counter, next to an upside down milk carton that is drying on the window sill. 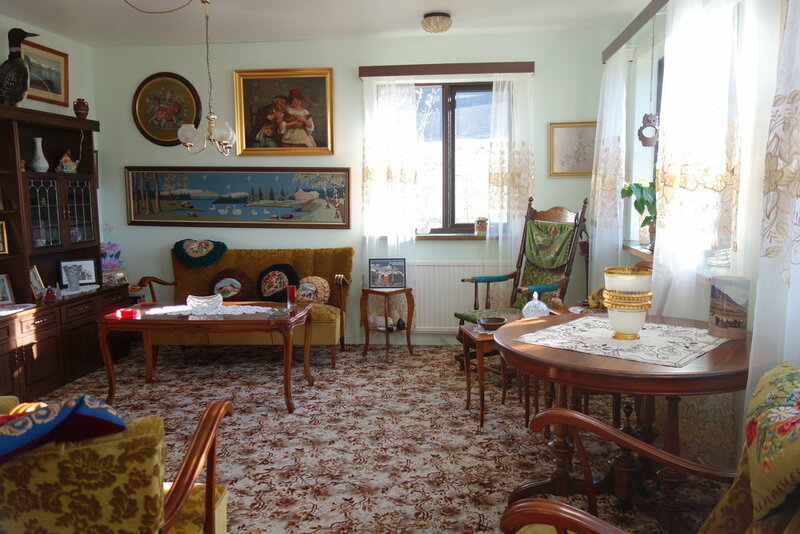 There are lace curtains and assorted antiques, making up the classic, outspoken kitsch Icelandic interior. Next to the kitchen is a room full of old photographs- generations who occupied these same walls, or some variation of it. The whole house is covered in carpets and colorful wallpapers. There are embroidered pillows, grandfather clocks and taxidermy ducks. We sit in the kitchen and drink coffee until Vilhjalmur arrives. He and his brother live here, with their mother, helping to take care fo the farm. The farm has been in use well over a century, and the history is evident as you walk from one room to another. The old farm is built up with layers of new and old technology. They still operate with much older technology then you see in most of iceland: typically milk is pumped automatically and the work day is only a few hours. 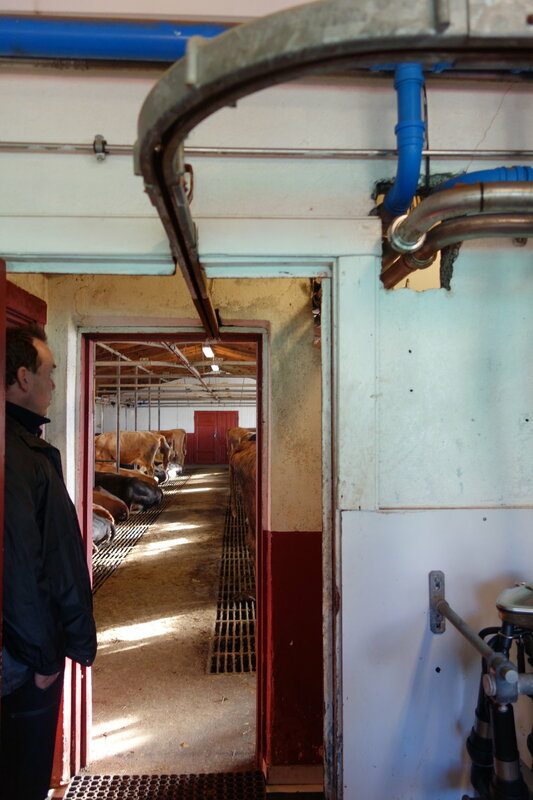 Here, there are structures running from one stall to another, connecting the cows to pumping machinery. On the side of the barn, old machinery is stored. The pipes are rusting and falling apart, soon the farm will need to be redone and changed completely in order to catch up with the rest of Iceland and demands from the government and manufacturers. Every time we move from one room to another, the environment shifts. Next to each room that houses livestock, there is a room for hay. Moving from one room to another feels like night at day. You are in a warm, light, smelly room with thick air and the sound of happy cows, and then you duck through the doorway and step into a cold, dry room where the hay is left to dry. It is dark and freezing cold. 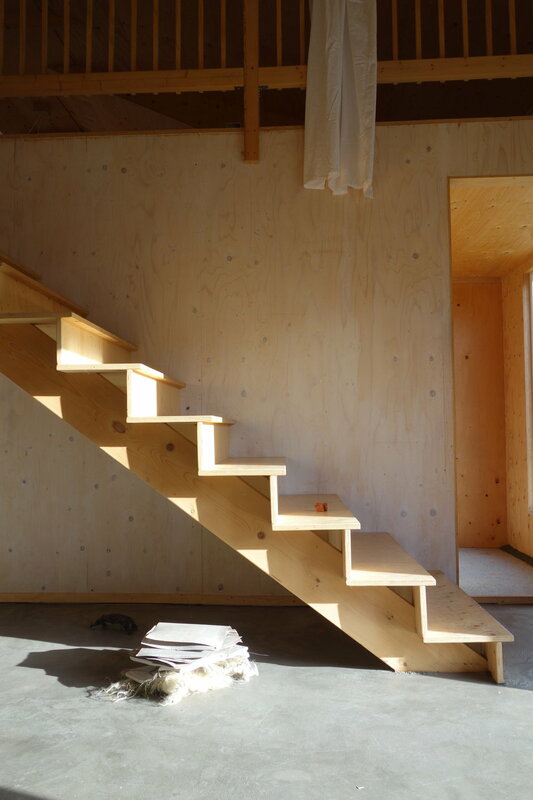 With such thin, wooden walls, it is amazing that the environment can change so quickly. 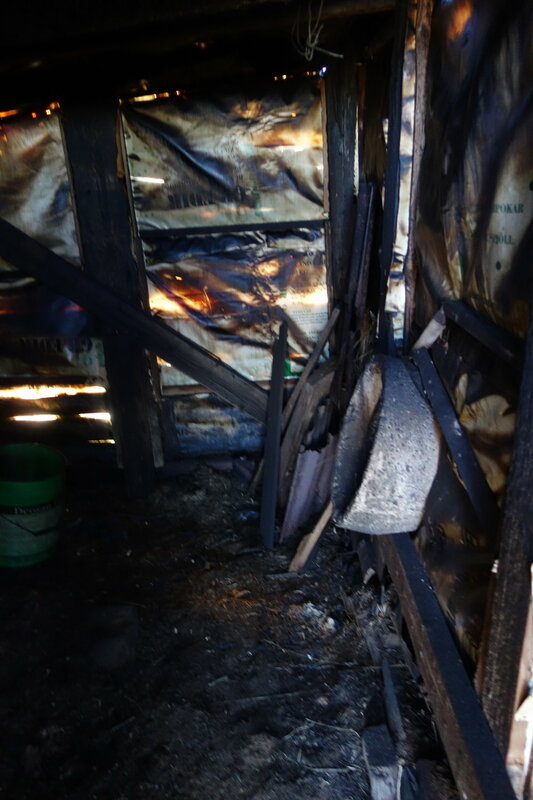 Outside the farm, the walls that face east are damaged from the weather and along the sides of the whole barn are marks from the bodies and horns of sheep who rub against the sides of the barn as they are herded inside. The rams are kept separate from the other sheep, they live in pens with elevated walkways while the others roam freely outside. The space they occupy is always changing, with planks of wood piled in a separate room, used to create pens for mating, giving birth, and separating rams. They are all so friendly when we walk in; big balls of wool (to keep them warm all winter) that follow us wherever we go. One ram’s horns have been cut, they had begun to grow into the side of his face. In the room next to where the lambs are kept, old hooks hang. There are so many interesting structures for hanging and drying here, but this one, which seems the most obvious, is no longer in use. Meat is no longer slaughtered on farms in Iceland, and because of this, there is no use for a room where slaughtered meat is hung. Instead, the insulated, warm room holds hooks that hang on hooks. Suggesting a practice that no longer exists here. Walk outside and you are struck by the beauty of the location. Seydisfjordur is already cast in darkness, but here we are less sheltered by the mountains and the light is longer. The shadows are low. Outside, the land is divided by channels, functioning to dry elevated fields of hay and water lower fields of grazing grass. Across the channels, rickety bridges connect the land. We walk across one that connects the farm to the smoke house. Here, two small houses sit on top of one another, connected by a pipe. 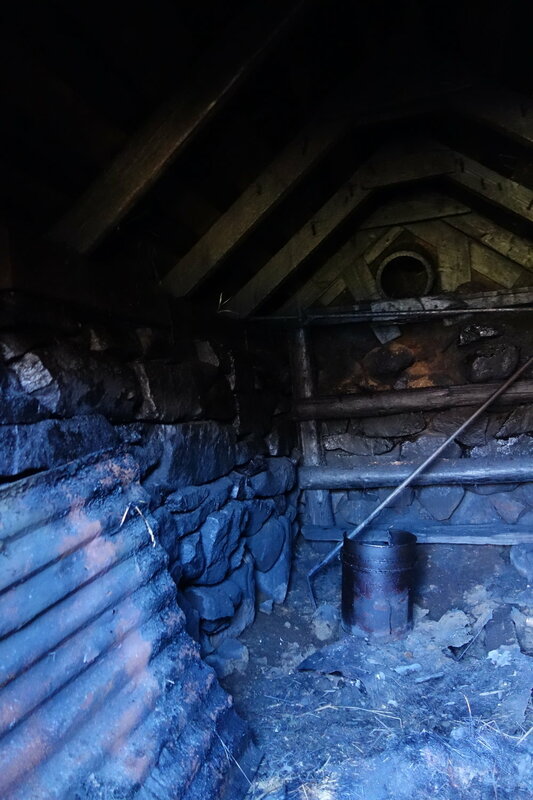 On the lower level, sheep dung and wood burn to heat to room. The smoke is funneled up to the elevated room, where the meat is smoked with birch wood and other foraged herbs. The smoke house wasn’t being used, and hadn’t been for a few weeks, but still, the smell was overwhelming. The rooms were dark and ashy. As we left we drove by the truck that was coming to pick up milk from the farm. The same company collects dairy from all of the farms in Iceland, bringing the dairy to Akryary where products are made. All at same factory. Funny contradiction, there are so many family run businesses but they don’t produce any products, like the fish market, everything is sent to another distributer. Everything is monitoted and the same, not diverse because there is only one company for everything. I have so much more I want to say, but I don’t think I have time to today. I arrived home late last night and now I am sitting in my apartment in Brooklyn. I am scared I will lose these memories and I am sad to have left such a magical place behind. But I am so thankful for the experience and the growth. I look forward to returning and I am glad that I know a place like Seydisfjordur exists. In classic Icelandic humor, l was told to hurry back to Iceland soon, because they may not be there for much longer.